My friend Karrie from Happy Money Saver has made a cookbook and you can pre-order it from Target.com. 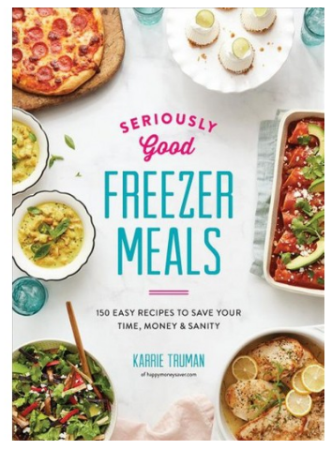 You can pre-order the Seriously Good Freezer Meals : 150 Easy Recipes to Save Your Time, Money and Sanity at Target.com for $16.34 (reg $24.95). I’ve actually found that Target has the cheapest price (it’s $22.46 at Amazon). Karrie is the queen of freezer meals, I personally love her recipe for Homemade Chicken Taquitos with Cilantro & Pepper-Jack Cheese. We’ve made it lots of times at our house. I’ve already pre-ordered my book! If you are looking for an easy way to get meals on the table at dinner time this is the book for you. You will save 5% and it will ship for FREE if you pay with your Target REDcard.